Hello, my loves! A quick update on life before I start the review. You may have noticed I’ve been away for a bit, well on my birthday, my friend and I decided we are going to make a spontaneous trip…… to THAILAND!! And the best part is it’s for a BTS concert. Are you seeing today’s theme is Kpop? It’s been a while since I’ve read contemporary… like a LONG time. Seriously think the last real one was the Fault in Our Stars??? But this year I’ve read 2! I’ve never been a romance kinda gal, but friends….. I ADORED THIS BOOK. Seriously, it was over and I just wanted to immediately buy all of Maurene Goo’s books. (Stupid spending ban) Am I into contemporary books now? 2019 is really shaping up to be the year of new books. New Year, New Me. Lucky/Fern: an up and coming Korean-American idol. At 18, she’s just finished her last concert in Hong Kong after a long Asian tour. Her next stop is to come to America for American debut that hopefully wins her some new fans. She loves to perform and sing, but lately has been just going through the motions. Although she is originally from America, she moved at a young age to Seoul to pursue a music career. She has a very clean record and has not been involved in any scandals. Lucky is her stage name. Jack: an 18 old Korean-American, who moved with his family to Hong Kong just a few years ago. He’s just graduated from high school and is taking a gap year, working for his father’s bank. He has a passion for photography but doesn’t think his parents would approve of him going to school for it. He also moonlights as a tabloid photographer, photographing all the dirt he can find on famous people. Lucky’s search for a hamburger is what brings these two characters together in Hong Kong. Think Roman Holiday in Hong Kong. Both Jack and Lucky have secrets they are keeping from each other but still managed to have a fun 24 hours together filled with food, a little romance, Hong Kong scenery and more food. This was a joy to read from the very beginning. I’m a huge fan of Kpop (BTS FOR LIFE) so I was already really excited for this to come out. But it was the growth in characters that really sold me. Told from both Jack and Lucky’s perspective, I thought this was a really cool premise. Two polar opposite characters spend a fun-filled day together and help each other become better versions of themselves. It’s hard to write a book based on a mostly 24-hour time window, and Maurene does a wonderful job. It’s paced so well that I kept forgetting this was all happening in such one day. The setting of Hong Kong leaps off the page as the author is very descriptive with the sights, tastes of Hong Kong. Was Hong Kong on my list of places to visit…yes. But now it’s at the top of the list of places I would like to visit. I really liked Somewhere Only We Know. I thought it had a cute plot, precious characters and a setting I would kill to be in right now. 2019 is the year I read other genres besides just fantasy and comics, lol. Is this the best contemporary book I’ve ever read, who knows. But I enjoyed it and I think a lot of people will all enjoy this incredibly cute story. Happy Monday friends! I just got back from Yallfest last night and it was such a fantastic weekend! I’ll be sharing a recap of the weekend tomorrow. But after this weekend I’m more excited to be sharing this review. This weekend I met a bunch a girls who all had Wicked Saints ARCs and I couldn’t help but fangirl over it with them. So this review is dedicated to my 5 new friends who let me rave about this book while standing in line for an hour. Something Dark and Holy, indeed. My friends, I hope you’re ready for April because Wicked Saints is ready to sweep you away. Are you ready to enter this dark, new world? Reminiscent of The Grisha Trilogy and Joan of Arc, Wicked Saints takes the reader on a journey where right and wrong aren’t always black and white. Trigger Warnings: Self Harm and Abuse are very much a part of the entire novel. The author has been very vocal about this but please stay safe everyone. You can read her review and explanation here. Most clerics hear the voice of one god to grant them a particular power. Nadezhda Lapteva hears the whole pantheon of gods and they each give power as well as a divine calling. Nadya grew up understanding she was the last cleric and her will was the gods’ will. Her country is at war with the neighboring country, a country her religion calls “heretics”. People who have shunned the gods and practice their own form of magic, blood mages. When Serefin, the high prince and a dangerous blood mage, attacks her monastery, Nadya is forced to flee her home to fulfill her divine calling. While on the run from the enemy, she finds a group of so-called rebels. These people have decided not to choose a side but would still like for the war to be over. Their leader, Malachiaz, convinces Nadya to go against the god’s wishes and infiltrate the enemy from within the palace. This begins Nadya’s journey into enemy territory while not know who she can trust. This story is told in dual POV. While I enjoyed Serefin’s character development I am more excited to see where he will be in the next book. They left it so open-ended, I think he’s going to be a huge part of this overall story. Nadya is my girl. Her character development was amazingly on point. Who she was at the beginning is not how she ended up by the ending. The ROMANCE!!!!! The perfect ship. The optimist vs. pragmatist. Light vs. Darkness. I can’t help but think of Alina/The Darkling from Grisha and Damon/Elena from TVD. Morozko from The Winterwitch Trilogy. Duncan’s writing gives off the best medieval vibes. Nadya has strong characteristics to Joan of Arc and other medieval martyrs. The story was so intriguing to read. Betrayal and the blurred line between faith and heresy makes Wicked Saints a perfect story for fans of Grey areas. Raw imaginary make this an extremely easy and fast read. This is a one of a kind story that takes the reader on a journey through medieval cathedrals and ruins of a war-torn country. 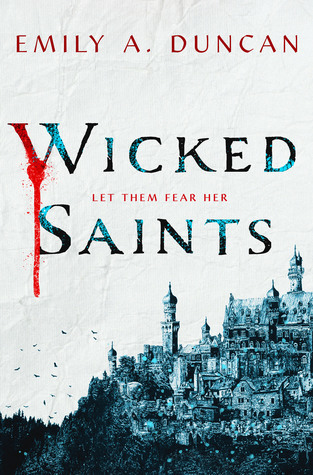 I think I lot of people will fall in love with Wicked Saints come April. I quick-paced book sure to thrill any fan of dark fantasy YA. Be sure to keep Wicked Saints in your sights in April 2019!